Today I'm sharing a tutorial for an embroidered corduroy scarf I designed for Coats and Clark. 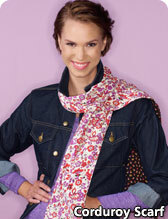 You can find the entire pattern and step-by-step directions with photos on the Coats blog here. I used two prints from Denyse Schmidt's new line of corduroy from her Chicopee collection for FreeSpirit fabrics. It's a fine wale corduroy and it is amazingly soft with a great hand and drape. The scarf is really simple to construct and if you look closely you can see that I added some hand embroidery stitches, using the design of the print on the fabric as a guide. I used Coats Dual Duty Craft & Button thread for the embroidery in coordinating colors and I really love the result. The thread is really thick and has a beautiful sheen that gives the finished scarf a lot of texture. And now, of course, I want to make a quilt out of corduroy with some hand stitching with the Craft & Button thread. One day! The scarf is made with two prints, and you can see the back of it a bit in the photo above, so it's reversible too. And with just two yards of each of the prints, you can make up to seven finished scarves, since the fabrics are cut lengthwise. I think they would make great gifts for the holidays, which as you know are right around the corner! Great job! Love the pop from the embroidery! You clever thing! I love that you added stitches over the print.